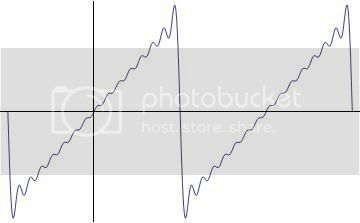 - A time vs. recursion graph on the arm that's tilted 45 degrees clockwise so that the actual line for the graph is just a straight band around the arm, thus making a graph which embeds itself inside itself indefinitely as the recursion axis increases. - A time vs. r (standing for either recursion or space for a Minkowski diagram) that's not tilted on the arm with a 45 degree line (speed of light for Minkowski diagram). 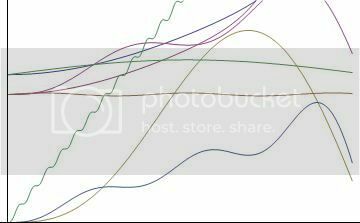 In order to make the line wrap in on itself, I'd make it a Fourier series expansion to some finite order so you can see some good sine wave components in there, and then it's defined to be periodic at a period of the arm circumference, naturally. - For a text-based tattoo, I've got (sic): The following is a fine example of the liar's paradox, "
- And finally, it's harder to describe, but a back-and-forth sequence of -i d/dx((1/i) d/dx(-i d/dx((1/i) d/dx (-i d/dx( back and forth making an arm band. This can come to represent two mutually recursive sets of numbers which define Cosine and - i Sine respectively, spelling out Euler's identity (this last one I used to define two mutually-recursive rings in group theory to propose with, the wife having Euler's identity as a tramp stamp). So yeah, any ideas for other clever recursion-based tattoos? But yeah, your sine cosine thing seems good, apart from my having no idea how that is supposed to work. Wouldn't the obvious recursion tattoo be to have one that shows a picture of the place on your body that includes that tattoo? Damn, that tattoo thread is massive, but they didn't seem to get into recursion so I'll re-post over there. If the good people want to take this down that'd be alright, I don't know how these things work here (does "merging" copy future thread posts, in which case this one can stand alone and also contribute to the greater thread?). LaserGuy wrote: Wouldn't the obvious recursion tattoo be to have one that shows a picture of the place on your body that includes that tattoo? Yeah, that's definitely an option. Though it ends up being more "implied" recursion than actual (for infinite recursion at any rate, go hard or go home). The best of this idea that I've heard was a tattoo on my chest of me ripping off my shirt, embedded a couple times for good measure. doogly wrote: But yeah, your sine cosine thing seems good, apart from my having no idea how that is supposed to work. Now for C, you can define C_n (the nth element of C) as C_n = (1/i) d(S_n)/dx , and you can likewise define S_n as S_n = -i d(C_(n+1))/dx. C_n = (1/i) d(S_n)/dx = (1/i) d(-i d(C_(n+1))/dx)/dx = (1/i) d(-i d((1/i)d(S_(n+1))/dx)/dx)/dx = (1/i) d(-i d((1/i)d(-i d(C_(n+2))/dx)/dx)/dx)/dx etc. 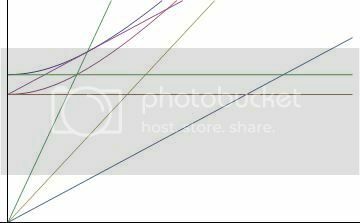 So for the arm band idea: -i d/dx((1/i) d/dx(-i d/dx((1/i) d/dx (-i d/dx( I really meant the above line, but with this kind of representation which is something that's a lot easier to write down on paper. Here, lemme try out this fancy Math button thing. This is a stylized version of the above Minkowski diagram. 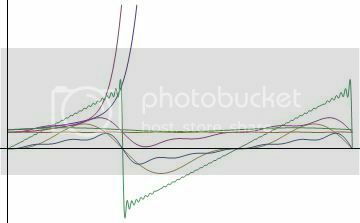 Same graph as above, but the cyclic nature is drawn out, which has the consequence of making the graph totally unrecognizable as relating to a Minkowski diagram (that makes it artistic right?). Same graph as above, but emphasizing the periodicity. This is the normal Minkowski diagram situation of two reference frames that the other graphs play off of with Fourier series approximation. Last edited by Malconstant on Wed Aug 24, 2011 4:00 pm UTC, edited 2 times in total. Technical Ben wrote: PS, doogly, way to miss the point. Malconstant wrote: Yeah, that's definitely an option. Though it ends up being more "implied" recursion than actual (for infinite recursion at any rate, go hard or go home). The best of this idea that I've heard was a tattoo on my chest of me ripping off my shirt, embedded a couple times for good measure. Yeah, that is a great idea. I'm not grabbed by these ideas, but it's not going on my arm so that's okay. I suppose the logician in me would be mildly amused by "-- the preceding yields falsehood when infinitely repeated" wrapped around the arm if recursion is what you're after. You could write something like "get a life to get a girlfriend to" with "to" ending just before the beginning of "get". It would read "get a life to get a girlfriend to get a life to get a girlfriend to get a life to get a girlfriend to...". Or the more classical dictionary entry: "Recursion: see Recursion." "Ich bin ein Teil von jener Kraft, die stets das Böse will und stets das Gute schafft." replace the pencil with a tattoo needle and you're set. Giallo wrote: "get a life to get a girlfriend to get a life to get a girlfriend to get a life to get a girlfriend to...". Ooo, That's a sad one. I feel that may be rule number 2 in avoiding long-term tattoo regret. Rule number 1 being irony. tilt your head to the side and it becomes x^x^x^x^x^x^x^x^x^x^x^x^x^x^x^x^x^x^x... which is a kind of fun function to think about, along with its derivative. Probably not compelling enough for a tattoo, but oh well. I tried to think of a way to work in a Klein bottle (because I guess mobius strips are too cliche for me, but one more dimension must be a ok), but I haven't been able to come up with an elegant way of doing it. That's not a bad idea. I was trying to think of ways of drawing in hands that are "drawing" my actual hands. Or maybe draw in a tiny Escher on my forearm, where we share my right hand (so a perspective shot I guess), and then with his left hand he could be "drawing in" our mutual right hand, though I feel that's also destined for regret. I'd definitely be down for a good (simple/elegant) Escher-style optical illusion though, but that may diverge too strongly from mathematics to be worth getting into here. Yeah, hand on hand with tattoo needles sounds pretty dope. I would not actually tattoo the wrist and hand though. Giallo wrote: You could write something like "get a life to get a girlfriend to" with "to" ending just before the beginning of "get". It would read "get a life to get a girlfriend to get a life to get a girlfriend to get a life to get a girlfriend to...". better would be "work a job to earn some money to live a life to"
AvatarIII wrote: better would be "work a job to earn some money to live a life to"
live a life to work a job? Your employers must love you. How about a positive event chain one? something like "make someone else smile, brighten their day, now that person will want to"
That'd be a fun one to turn into an arm/leg/finger band. I can appreciate the lack of subtlety. maybe better would be "get paid to work to live to get paid"
AvatarIII wrote: maybe better would be "get paid to work to live to get paid"
Maybe, though I think the trap lies with "to work" I'm not sure it's possible to put that in an implicitly depressing message in a way that's like "yeah, that's why I'm doing it, my partial end game is the work itself." Also I included the smbc link in the spoiler. The forum won't let me embed URL's (is that a threshold number of posts thing?) so I was trying to be discreet about posting to another webcomic while I'm still new to these forums. But of course you're quite right. i guess, but i was going for "getting paid to work" as in "getting paid for the work" like "i got paid to mow the lawn"
and i quoted you before you edited in the reference, or the spoiler tag, and since i only read 2 web comics, xkcd and smbc, i knew what you were talking about, but i thought i'd link to smbc for you, and for the people that might not read it. Malconstant wrote: "make someone else smile, brighten their day, now that person will want to"
"...your eyes reflecting my eyes reflecting..."? You could try jethro tull; "watching me watching you watching him". 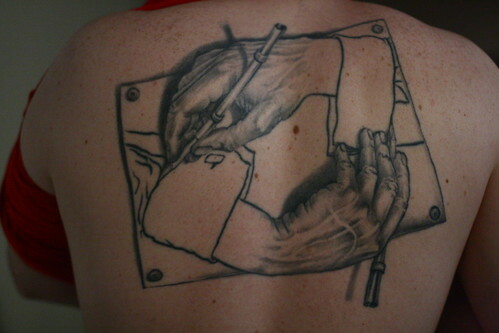 How about some kind of variation on Escher's "Drawing Hands", eg with the hands holding tattoo guns instead of pencils? you mean exactly what Talith said earlier in the thread? Get a tattoo that contains all the tattoos that contain themselves. GOD_Over_Djinn wrote: Get a tattoo that contains all the tattoos that contain themselves. Hahahaha. I loved this. Although I read it as "get a tattoo that contains all the tattoos", and that's the one I actually want. AvatarIII wrote: you mean exactly what Talith said earlier in the thread? PM 2Ring wrote: How about http://mathworld.wolfram.com/TuppersSelf-ReferentialFormula.html, then? Also delightful. I'll need to look over some GEB sometime, I recall there was a program written very much like that idea. If you are into that sort of thing you could go with a fixed point combinator. EvanED wrote: be aware that when most people say "regular expression" they really mean "something that is almost, but not quite, entirely unlike a regular expression"
Location: Somewhere on the moon. As the great philosopher Socrates once said: "No." Ever since I read the GOD (GOD Over Djinn) narrative from GEB, I've thought that an illustration of the genies exactly halfway through the "moment" it takes for the genie to ask the infinite chain of meta-genies (i.e., when there is an infinite number of genies summoned) with each genie a fraction the size of the last would make a pretty cool illustration. Wouldn't make a bad tattoo, either, I would suppose.